Seeking natural remedies outside of chemical pharmaceuticals isn't just for Eastern medicine. In fact, plant-based health cure also has a long tradition in Western medicine, as evidenced by a beautifully illustrated book in the British Libary's collection. The Cotton MS Vitellius C III is a 1,000-year-old illustrated manual to plant pharmacology, and has now been digitized for online viewing. 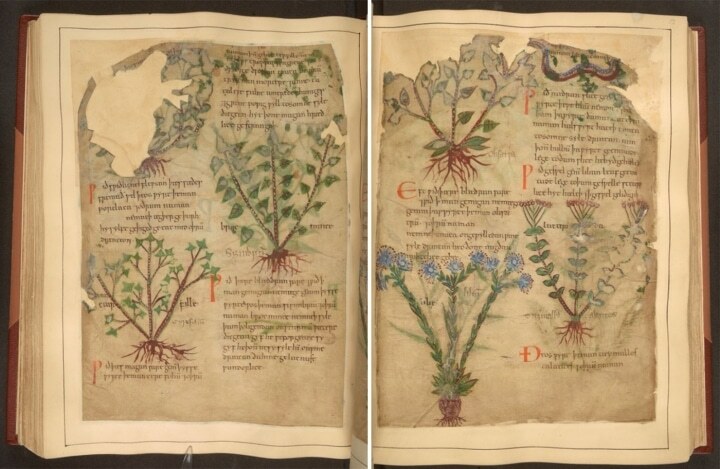 The beautifully illustrated 11th-century book is filled with “herbals,” natural plant-based treatments to cure everything from body odor (simmer artichokes in wine) to easing chest pain (licorice root does the trick). Zooming in on the high-resolution scan, it's incredible to see the Old English script and detailed drawings of the plants and animals used for their healing properties.